This quote exemplifies the actions of BLACF’s 2018 Award in Philanthropy recipient, the Ruttger Family. The Ruttgers are passionate about family and community. 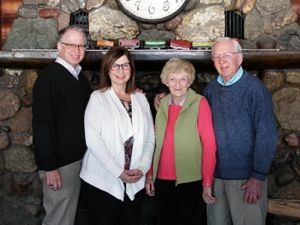 For over 119 years they have operated a family resort, Ruttger’s Bay Lake Lodge, in the Deerwood area, offering a family-oriented livelihood to hundreds of employees. They willingly donate to benefits for local residents, fundraisers, their lake association and educational opportunities as well as offer their time and talent as volunteers in numerous worthy causes. The BLACF Ruttger Enhanced Reading Fund was established to benefit the Crosby-Ironton and Aitkin elementary schools. Since its inception, more than $75,000 has been donated, and they now have two of the best Level Reader libraries in Minnesota because of the gifts. The Ruttgers support Junior Achievement by allowing employees to lead classes in schools and by hosting entire school events, allowing children to experience work first hand while having fun. Salem WEST has been a recipient of donated funds, furniture and bedding from the resort as they change décor. Ruttger’s offers significant discounts for people in financial need and free silent auction vacations for fundraisers. They support smaller businesses through partnership, mentoring and loaning equipment. They are on the forefront of green business and since inception have been involved with the Bay Lake Improvement and fight against invasive species. In addition, the entire family are leaders in church, schools, Rotary, Crossing Arts Alliance, Chamber of Commerce, Mountain Bike CREW, Minnesota DNR, Historical Societies and other organizations. The Ruttgers are kind, compassionate and humble people who are truly sincere in all their actions and genuinely concerned about others. They show the value of hard work and encourage learning and advancement. Congratulations to the Ruttger Family: Chris, Joanne, Ann and Jack! Well done, and well deserved.